+Ham Radio in Hollywood: Blockbuster Movie Features Morse Code, Homebrew Equipment -- and Sea Monsters! A bill that passed both the House and the Senate on February 17 -- and signed into law by President Obama on Wednesday, February 22 -- includes a provision for a study of the uses and capabilities of Amateur Radio Service communications in emergencies and disaster relief. Section 6414 of the Middle Class Tax Relief and Job Creation Act of 2012 mandates the completion of the study, with a report of the findings to the House Committee on Energy and Commerce and the Senate Committee on Commerce, Science, and Transportation. This study would "use the expertise of stakeholder entities and organizations" to recommend how to best use radio amateurs in emergency communications and disaster relief efforts, and how to best utilize the Amateur Radio Service in coordination with the federal government in these efforts. In addition, the study would also discuss the effects of unreasonable or unnecessary private land use restrictions on residential antenna installations and recommend ways to remove such impediments. The bill passed in the House by a vote of 293-132. In the Senate, it passed by a 60-36 vote. Read more here. With the CW portion of the ARRL International DX Contest now a series of fading dits and dahs in the memories of participants, preparations for the SSB portion of the DX Contest -- the weekend of March 3-4 -- are already underway. According to ARRL Contest Branch Manager Sean Kutzko, KX9X, for this contest, stations in the US and Canada work only DX stations, and DX stations work only the US and Canada; Alaska and Hawaii are considered DX for this contest. 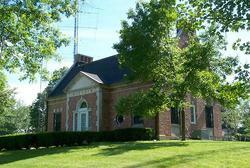 DX stations will be trying to make QSOs with all US states and Canadian provinces. The contest exchange is simple: US and Canadian stations send a signal report and their state or province, while DX stations send a signal report and the amount of power they are transmitting with. "The CW portion had a lot of twists and turns," Kutzko recounted. "The solar flux index was down considerably from the great conditions we experienced in the last quarter of 2011. We were also dealt a blow with a solar storm on Saturday afternoon, generating some strange phenomena on the bands. Ten meters -- which earlier in the contest season was open to Europe and Asia for hours at a time -- barely showed up this past weekend. Despite all of this, hams worked tons of DX on 15 and even 10 meters." Will these conditions improve? It's hard to say -- the SFI remains around 100, and just a week before the contest, the A and K indices are reasonably low. "Check the K7RA Solar Update each Friday on the ARRL website for the most current solar forecast," Kutzko advised. "But one thing is for certain: The number of participants in the 2011-2012 contest season has exploded, and more activity means lots of DX." The ARRL International DX SSB Contest runs from 0000 UTC Saturday, March 3 to 2359 UTC Sunday, March 4. Complete rules and forms can be found online. Electronic logs should be submitted via e-mail; paper logs can be sent to ARRL DX SSB Contest, 225 Main St, Newington, CT 06111. Paper logs must be postmarked no later than 0000 UTC Tuesday, April 3, 2012. In the movie Journey 2: The Mysterious Island, Sean Anderson (played by Josh Hutcherson) receives a coded distress signal that comes from a mysterious island where no island should exist. 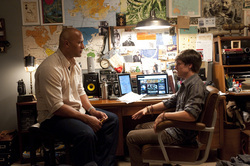 Sean decides to follow the signal with the unwilling assistance from his stepfather Hank (played by Dwayne "The Rock" Johnson). The Battleship Missouri Amateur Radio Club, KH6BB, provided all the radio gear for the movie. Both the QSL cards for KH6BB President Ned Conklin, KH7JJ, and for KH6BB can be seen on the bulletin board. The KH6BB card features the Missouri with her 16-inch guns firing. See a larger version of the photo here. The movie opens in Dayton, Ohio with Sean on his motorcycle, being chased by police officers. Sean had been caught breaking in to a "satellite facility." When questioned by Hank, Sean confesses that he had received a coded message from his grandfather (played by Michael Caine), but his equipment was too weak to copy it; he decided to go somewhere where there were bigger antennas. The message -- a string of one and two syllable words taken from the books of Jules Verne -- makes no sense to Sean. Hank, a former US Navy cryptographer, offers to help decode the message; he feels this will be a good chance to bond with his stepson. Immediately, Hank figures out that the message is really in Morse code: each one syllable word is a "dit," while each two syllable word is a "dah." Hank translates the message, which gives clues to the location of the grandfather's whereabouts. Read more here. W1AW Qualifying Runs are 10 PM EST Friday, March 9 (0300 UTC March 10) (10-40 WPM) and 7 PM EDT (2300 UTC) Tuesday, March 20. The West Coast Qualifying Run will be transmitted by station K6KPH on 3581.5, 7047.5, 14047.5, 18097.5 and 21067.5 kHz at 2 PM PDT (2200 UTC) Saturday, March 17. Unless indicated otherwise, speeds are from 10-35 WPM. You can find the upcoming schedule here. Two ARRL Sections -- Eastern Pennsylvania and Louisiana -- will get new Section Managers as of April 1, 2012. Two other Sections -- San Diego and Virginia -- will keep their incumbent Section Managers. Ballots for these races were counted Tuesday, February 21 at ARRL Headquarters. Read more here. 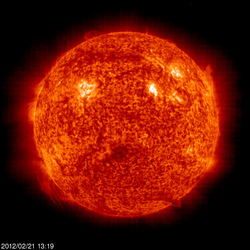 The Sun, as seen on Thursday, February 23, 2012 from NASA's SOHO Extreme Ultraviolet Imaging Telescope. This image was taken at 304 Angstrom; the bright material is at 60,000 to 80,000 Kelvin. Tad "Behind the clouds the Sun is shining" Cook, K7RA, reports: We don't know if this is a significant trend, but solar activity has really leveled off recently. Not everyone is unhappy about this: During the recent long minimum, 160 and 80 meter operators were very excited about conditions, and that enthusiasm seems to have increased of late. The average indicators this week were almost exactly the same as last. The average daily sunspot number rose from 55.6 to 55.7, while the average daily solar flux declined 2.6 points to 105. In an unusual coincidence, the average planetary A index and mid-latitude numbers were the same this week as last, 8 and 6.7 The latest prediction shows solar flux at 105 on February 23-24, 100 on February 25, 95 on February 26-29, 100 on March 1-4, 105 on March 5-11, 110 on March 12-13, and rising to 115 on March 14-19. The prediction also sees planetary A index at 8 on February 23, 5 on February 24-28, 7 on February 29, 5 on March 1, 8 on March 2-3, and 5 on March 4-6. Look for more information on the ARRL website on Friday, February 24. For more information concerning radio propagation, visit the ARRL Technical Information Service Propagation page. This week's "Tad Cookism" is brought to you by Disney's Cars. William A. Simons, W9BB (ex-W9YXJ), passed away in Minnesota on January 2. He was 84. He earned his Class B ticket in 1941 at the age of 14 and converted a cathedral radio into his first transmitter. Later, Simons earned DXCC using homebrew gear of his own design. Eventually, he earned a top spot on the ARRL DXCC Honor Roll. Read more here.